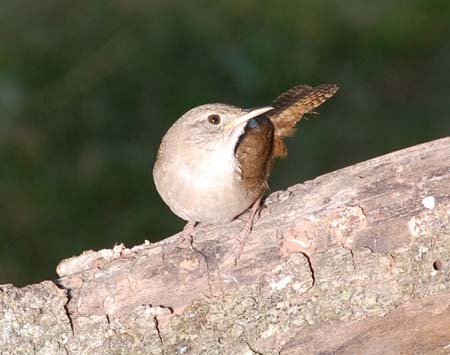 Both house and Carolina wrens are permanent summer residents in our yard. These tiny powerhouses are amazingly energetic, vocal, and sometimes quarrelsome. 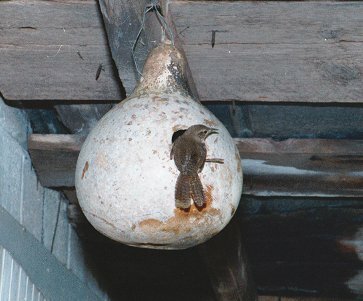 House wrens always nested in the workshop and various other outbuildings, as well as on the front porch and in whatever nestboxes suited them. While they offer a great source of entertainment, they became quite lethal to our bluebird population several years ago. Luckily, they were so taken with the gourds that we offered, that they now usually ignore the wooden bluebird boxes. 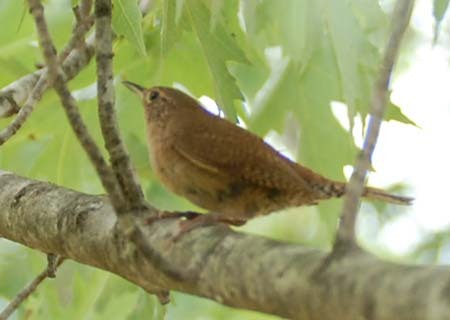 2010 update - House wrens are once again usurping nest boxes in our yard, but only in shaded areas. They have caused nesting failures of titmice two years in a row. The bluebird and tree swallow nest boxes in direct sunlight are not bothered. I have neglected to keep as many wren gourds available in recent years. 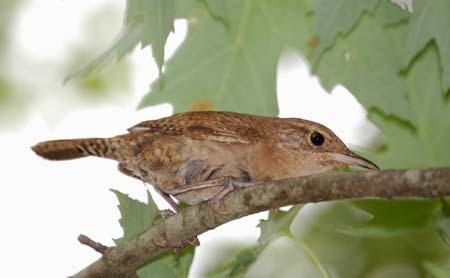 2012 update - This year, house wrens have discouraged tufted titmice from nesting in a box hung from a branch in a maple tree by the garden. In 2011, a house wren removed the first egg from the titmouse box, causing them to desert. This year, the titmice tried to nest in the same box, but gave up and moved to a more distant fence row. The garden wrens are also claiming all empty bluebird style boxes mounted on posts in the open. 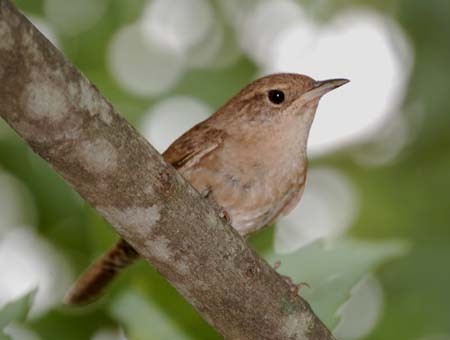 Sticks are quickly added to any vacant box and wrens are even fighting among themselves for occupancy of these boxes. The bluebirds and tree swallows have successfully nested in the post mounted boxes, thanks to their constant vigilance. Their nestbox is never left unguarded. But, the wrens claimed two of the three boxes after the first brood. I've been negligent in placing wren gourds in the fence rows near the garden the past two years, which is likely why the wrens have resorted to nesting in the post mounted bluebird boxes out in the open. 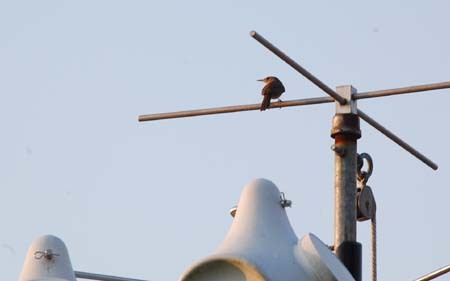 House wrens even invade the purple martins' territory, trying to claim an unused gourd. And they have sometimes destroyed Northern flicker eggs and even visited a kestrel nest box where the nestlings were larger than the wren. See the flicker and kestrel pages for accounts of these events. Wren gourds a boon to bluebirds?